10 sparkling white diamonds line the sides of this spectacular ring set with a stunning center 1 carat black diamond in 14k white gold. 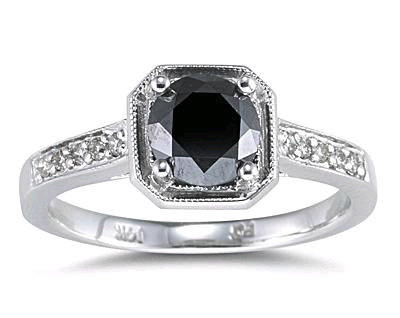 A beautiful piece that combines the hot look of black diamonds on an antique styled setting. White diamond side-stones total carat weight: 0.10 carats. We guarantee our 1 Carat Black Diamond Ring with White Diamond Side Stones to be high quality, authentic jewelry, as described above.